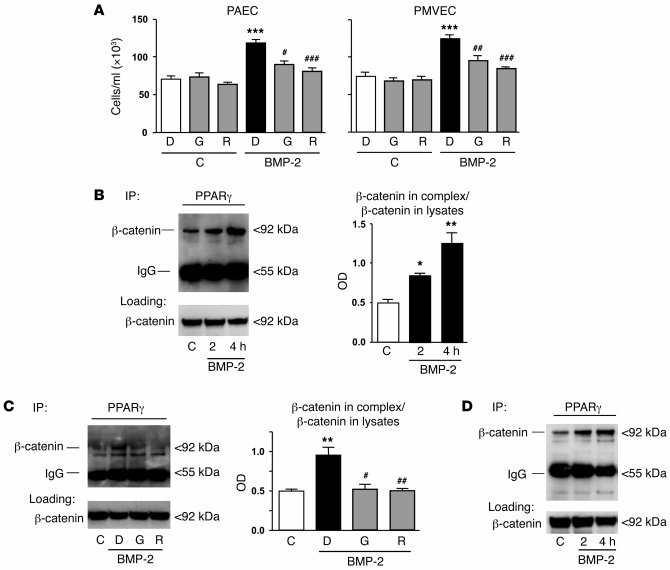 PPARγ ligands abrogate BMP-2–mediated survival and inhibit BMP-2–mediated interaction between PPARγ and β-catenin in PAECs. (A) Cell counts were used to determine PAEC and PMVEC survival after 24 hours under serum-free (SF) conditions. Equal numbers of cells were pretreated for 1 hour with DMSO (D; 1:10,000), GW9662 (G; 1 μM), or rosiglitazone (R; 1 μM) before stimulation with vehicle control (C) or BMP-2 (10 ng/ml). Bars represent mean ± SEM from 3 separate experiments with 3 replicates per condition. (B) Western immunoblot and densitometric analysis of β-catenin levels after IP with the PPARγ Ab in response to BMP-2. (C) Western immunoblot of β-catenin IP with PPARγ Ab under conditions in A. (D) β-catenin in nuclear extracts after IP with PPARγ Ab. In B–D, loading control shows β-catenin in lysates before IP. Bars represent mean ± SEM from 3 separate experiments. *P < 0.05, **P < 0.01, ***P < 0.001 vs. control; #P < 0.05, ##P < 0.01, ###P < 0.001 vs. DMSO; 1-way ANOVA with Bonferroni multiple comparison test.